A few years ago I was lucky enough to interview a then aspiring mecha designer by the name of Junji Okubo. At that point his work included games like Tekki (aka Steel Battalion) and the Gundam remake For The Barrel. His designs were unique as they depicted machines that looked almost palpably real. 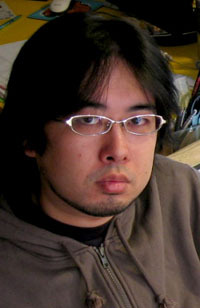 Since then Junji has worked on a few anime works, notably that of Appleseed Ex Machina and Viper’s Creed and also contributed to games such as Infinite Space. It seems that his work is finally garnering the appreciation it so sorely deserves. Not long after this interview was conducted, Junji contacted me to let me know that he was publishing a book of his work and that could he use the interview I did. Naturally, I was happy to oblige. So the following interview is the English translation of the one you read in his book, Izmojuki Industrial Divinities. Where were you born, and what was it like growing up? What things interested you as a child and why? I am from a town called Akishima in Tokyo. Although it is in Tokyo, Akishima was a suburban bed-town, quite a bit away from the central Tokyo. Being so far away from the centre, it was a quiet area benefited from abundant greenery and water. The environment Akishima offered was totally different from the commonly held image of Tokyo, a busy concrete jungle. Having said that, I had many opportunities to see real fighters and transport vehicles as there was the US Yokota Air Base in the neighbouring area. When I was a child I liked anime programmes and programmes with heroes in it on TV. I also liked watching Sci-Fi films from Hollywood. I was keen on drawing/painting, so I took a painting/drawing class that was run in the neighborhood after school. Your mecha design is very realistic in tone. Considering the very fantastical nature of much of Japanese mecha design, how and why did you come about to adopt such a style? I think it is right in saying that the nature of Japanese mecha design is to embody what is fantastic. 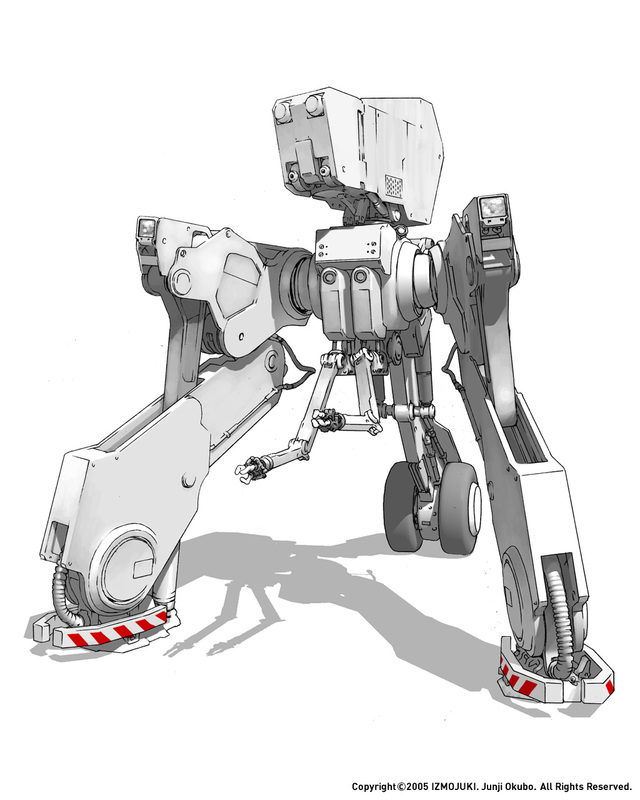 Mecha in anime, games, Sci-fi films in the West tend strongly towards being tools or devices “decorate” screens. On the other hand, I think mecha in Japanese anime or manga are closer to monsters or spectres, tangible but paranormal existences, in myths. Their roles are to entice people to enter into the world the stories present. In other words, they attract the third party to the world of the stories. For instance, in the Greek myth, there is an imaginary beast called Chimera. This monster has the head of a lion, the body of a goat, and the tail of a snake, and it breathes fire. A theory says that Chimera embodies the fear for the nature, symbolizing a mountainous area where pythons, goats and a pride of lions lived at the bottom, the hillside, and the erupting mountain peak respectively. In the case of Chimera, already known pieces of information are assembled to embody the paranormal power that is felt by humanity, and this method often characterizes the myths found around the world. In Buddhism, various icons of Buddha are assembled from signs and symbols. Combining known pieces of information into a design using a stimulating or shocking manner is also a way to hand down the design to future generations. The elements for an assembly change from one era to the other, reflecting the value widely held at a time. In the case of Chimera, the elements were lions, goats and snakes; these are now the arms and constructive machinery. In this sense, what I do at Izmojuki as well as what people do to design mecha for Japanese anime or manga are doing essentially the same as the way the image of Chimera came about. Whereas the heroes often found in the Christian world tend to be super human characters based on Jesus Christ, Japanese heroes, familiar amongst the wide age groups, tend to make them paranormally strong by relying on mecha they control. If not, robots themselves possess souls, and are regarded as something like gods. I suspect that the Japanese history has some impact on this. What I mean by history is Japan’s loss of the national religion and the subsequent change in value after the Second World War, and re-establishment of the country based on technology. However, this field has also been developed by strong support from toy companies who obviously have merchandising for boys in mind. The companies inevitably take children’s need for approval and men’s defense mechanism identification into consideration to appeal to them to encourage the consumption of toys (therefore not all can be attributed to Japanese history). As a result of toy companies’ need to appeal to boys and men, the design development seems to focus too much on appearance that leads to eccentric design. Speaking of eccentric design, this is called “keren“, the word often used in the mecha design process. The word, “keren”, was originally used in traditional Japanese art, such as kabuki or ningyojoruri, and it refers to stagecraft or directorial technique of the traditional theatre entertainment. Perhaps the national taste has some influence on the look of the design. Having done the above research, I decided that I aim to design, based on a fundamental rule. This is to say that I assemble the characteristics of constructive machinery and industrial machinery that I am familiar with into a symbolic form to create imaginative mecha beasts that could almost exist. The realistic impression from my design shows that the assembly is done effectively, in addition to limiting “keren” as much as possible. 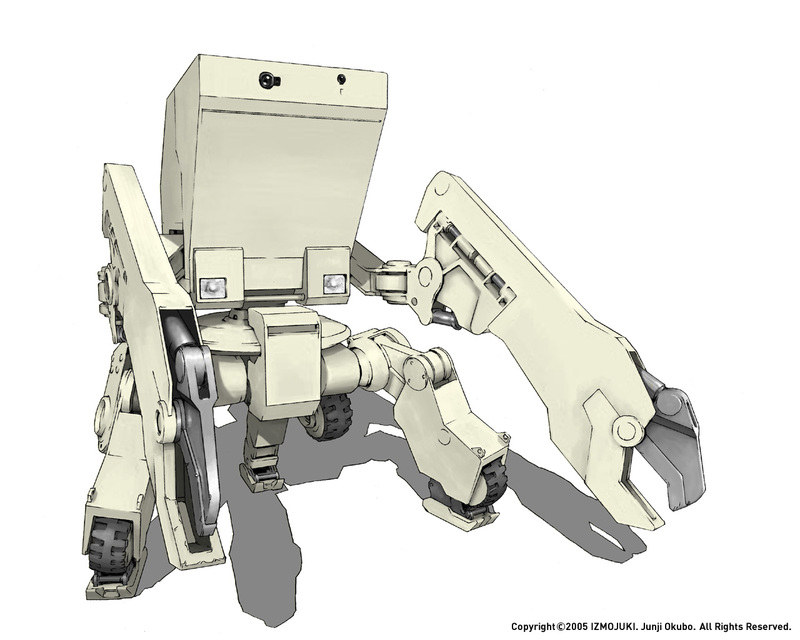 What other mecha designers do you respect and why? I have been greatly influenced by Ron Cobb, Joe Johnston and Syd Mead. As I adore Hollywood Sci-Fi movies in the 80’s, such as Star Wars, perhaps it is the reason why I admire these guys. In the Japanese anime, I like the works of a director Hayao Miyazaki and Kunio Okawara. As for Mr Okawara, I like his works from the 70’s rather than the ones he has done recently. I like the monster-like designs of mobile suits for the enemies in the original Gundam series but what I think brilliant is the designs of the mecha including the enemy mecha around the time of “Time Bokan” series. I find the simplicity of the lines that even a child could manage from his vague recollection particularly attractive, and I have always tried to aim for it myself. In the field of manga, I love Masamune Shirow. Although Ghost in the Shell is better known, I personally like Orion very much. 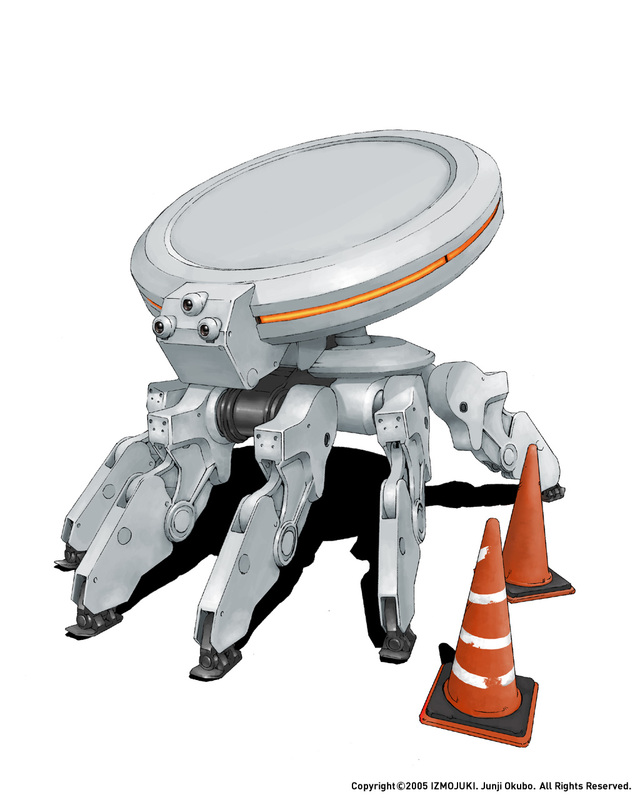 What other mecha designs do you respect and why? I am interested in the styles of Dunbine, Galient or Escaflowne that are all intentionally designed to look like fantasy (fantastic). This is because I can simply enjoy designing without worrying about restrictions based on realistic mechanical engineering viewpoint (having said that, the whole thing is unreal anyway). What is your favorite mecha anime and why? I still like AKIRA. Kaneda’s motorbike and SOL were sensational. I guess my work is influenced by this. I have not been watching anime recently so there is any particular one that I like. In fact, I am more interested in live-action films. I like gadgets in films that are fundamentally a part of a stage-set, and as such they do not claim any presence for themselves, and yet they are impressive. Good examples of these would be the devices that are used to capture the ghosts in the film “Ghost Busters,” as well as the Delorean in “Back to the Future,” and the Power Loader from “Aliens”. What was it like working on For The Barrel? Did you feel any pressure from Kunio Okawara’s work on the original Gundam? When the plan was brought to me, I was very very interested in it. In fact, the work process itself was very exciting, too. As I have heard that the original design of Gundam was the created after many trials and tribulations of not only Kunio Okawara, but also of Yoshiyuki Tomino and staff who were involved in Gundam at the time, the pressure was enormous. As such I started to present ideas more than 6 months prior to the commencement of the series, but the series began before the idea was totally consolidated in the end. It was after a few instalments that the design everything fell into its own place. In what way, if any, did the original Gundam influence you in your designs for For The Barrel? Where there any other influences? The origin of the plan was to create Gundam based on the novel without having any knowledge of original animated Gundam. Therefore I ignored original design as if it had not existed in the first place. This may be similar to the way Tim Burton produced the remake version of the Planet of the Apes. The only thing I took into consideration was the detailed technological bits that were accumulated over 20 years of Gundam culture (including building plastic models of Gundams) in realizing a robot that is 20 metres tall. The “machining skins” and other ships in For The Barrel again look very realistic, how did you approach the design of these? Unlike existing Gundam, there was no need to consider merchandising aspects with For The Barrel. The aim was to purely draw scenes that were in the novel more effectively and dramatically without being restricted by signifiers that were particular to Gundam. For instance, the robot equivalent to Zaku is described to be a single eyed giant in the novel. So I began to create it based on that information alone. I then came up with the logic that a gigantic humanoid arm should potentially give the sense of fear to the enemy, I decided to base this one eyed giant on the form of a Cyclops in Greek Myth. The shape of feet like artiodactyls was adopted from Cyclops in a film called The 7th Voyage of Sinbad. This is a homage to Ray Harryhausen. In order to express wiliness of the Zeon Army, I designed lines based on hammerhead shark. Inorganic eyes are also taken from the image of sharks. 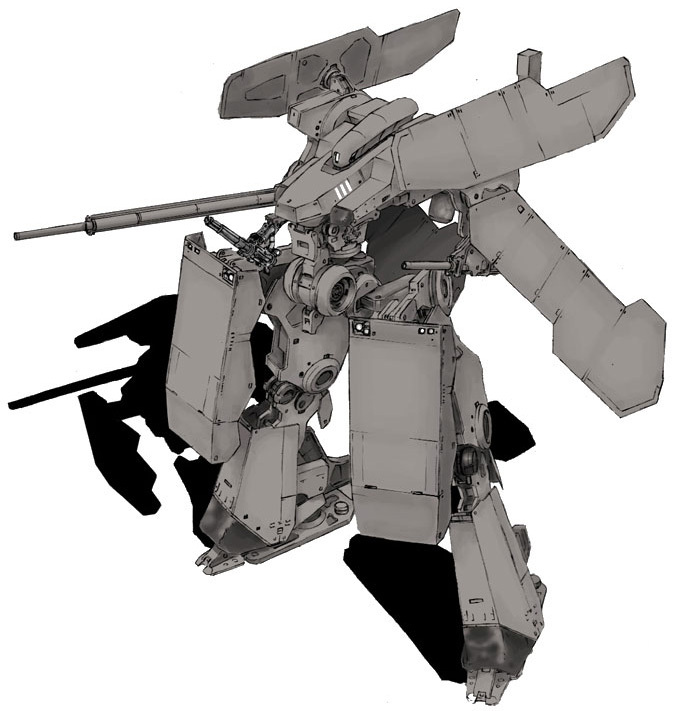 The robot of the federal army that is equivalent to Gundam, on the other hand, was designed as the fighters in the space with the addition of parts that are like arms and legs. The ideas for parts came about so that the robot may change directions by action-reaction forces based on mass transfer not by rockets. “The accidental humanoid” was the image I was trying to achieve. In addition, I made the color of the body of this robot white as it is nicknamed “white devil” by the Zeon in the novel. In the case of classic Gundam (and the Gundam series that is still continuing), mecha were designed with the elements from the simple moral of the robot anime heavily bearing merchandising into consideration. However, in For the Barrel, I designed the federation army robot to make it obvious that it is indeed a weapon as threatening as the Zaku. In addition, I restricted it to be a part of stage-set to make real protagonists stand out more. This was very experimental. As for the battle ships, the setting was the first era when the war in the space was made. Therefore, I designed them thinking that they were converted forcefully from spaceship that had been originally built for transportation and carrying goods, as I recall. How did you get involved with Capcom’s Tekki and Tekki Taisen games? It started off with my receiving an e-mail from Hifumi Kouno who looked at Izmojuki’s website. I did not quite know what Tekki would be like at the planning stage. I had nothing to do with Tekki Taisen though. The new VTs were designed by Capcom staff based on my design. How did you approach the design of the Vertical Tanks (VT), was it a difficult process? It was Mr Kawano’s idea to call tanks as Vertical Tanks, and the word already existed when the plan was brought to me. Therefore the motif I used was what VTs literally mean, tanks that can stand upright. I remember starting off with Decider that is in a way a main protagonist machine. To use lines which spread out from the centre of the chest is one of the most common designs found among the main mecha, and Decider is designed based on that. I also adopted a design from Japanese Samurai armor. When Decider transforms the attached arms on its arms to store them, they look like samurai with his sward around the waist. As it happens when I was working on VTs, I was working on For The Barrel as well. So I used the same approach to VTs in that unless it had special meaning, heroic decorations or colorings were eliminated. What I found difficult was to come up with the way for VTs to stand up again when they fall. It would be solved if VTs had arms but that would make them look increasingly like humans and therefore unrealistic. In the end I made a compromise with the function of getting them up as it was a game after all. The 20 meter tall arms with turbine engines that stand and walk would not be able to fight once they fall, to begin with. It was such a dilemma, having to decide what should be the emphasis of VTs; the dramatic nature of the game, reality as a machine, or visually attractive design. Considering the uniquely large controller Tekki needed, was this taken into account in your design of the VTs and did you have any say in the design of the controller itself? I knew that there was going to be a controller right from the start, at the planning stage. I thought, then, that the controller was going to be the main feature and that the simulation element was going to be involved in the game, making it important design VTs as a vehicle rather than a hero robot with which a player needs to identify with. Although I was not involved in designing the controller, I was informed of rough ideas for buttons and levers the controller would have. So I reflected them on the design of the controller. What is your favourite mecha game and why? I love the Metroid series. I am not good at games in which one gets onto a robot and takes control of it, such as Gungriffon or Armored Core. To tell you the truth, I have not played Tekki much. Your sister site, The Eight Bit Fighters, displays old ships from classic shoot-em-ups rendered in CG. What motivated you to start a project such as this? Do you have any intention to continue it? Would you ever undertake a Sixteen Bit Fighters project for example? Usually I am making my living out of drawing illustrations for brochures or anything on paper, visual material production, and website designs. When one designs mechanical characters for games or anime on a freelance basis, without belonging to a large anime production companies etc., like myself, in Japan, the reward one gets is extremely small. It is impossible to make a living out of mecha-designing alone, to be honest. Despite all this, dreaming that one day I may be able to take part in a big project in anime, game or film, I launched the Eightbit Fighters to continue to improve my mecha-design techniques, using what little free time I have left doing my other jobs. For me, 8 bit game offers setting, the world, and 8×8 pixels, the bare basis. In a sense, this is like an exercise book to improve my imagination and design skills. If I make it 16 bits, then, the exercise inevitably becomes easier, making it less challenging for me. So there is no plan to undertake 16bit fighters as a project. The reality is that recently I have been so busy with my work (other than mecha designing) I am unable to even update The Eightbit Fighters. What is your favorite shoot-em-up and why? All the games I took up for The Eightbit Fighters are the games that I was familiar with as a child. Xevious in particular is my favourite in terms of its depth and graphic sound. I like all the shooting games from the NES Famicom era such as Gradius, TwinBee or Star Soldier. Apart from illustration and graphic design what other interests occupy your time? I like music and theatre. Recently I enjoy watching silly (light-hearted) plays by some group of avant-garde actors in a small live house. Actually I take part in a certain theatrical group as a backstage staff. My main task is to deal with visual materials and costumes that are used in a play. As I do this as a hobby, I take these tasks on in a relaxed manner to enjoy myself. Designing costumes can offer a lot to learn to design characters, however. It feels very good to feel live reaction of the audience in the theatre while I watch the production I am involved with, unlike illustration assignments or design assignments. You have a large selection of clients, from MTV and NHK to Capcom and Bandai, how does your workload differ from your previous work on anime/manga and games, as well as from client to client? Actually I have not had much experience with anime or manga. The majority of works I do is the outsourced design (web-site, brochure or advertisement), and illustration which cannot be further away from mecha design, such as illustration for association of the dentists, for instance. As for mecha design my experience is limited to For the Barrel, Tekki and MTV characters. I am interested in anime and manga as a field, but the workload involved in those would be enormous. In addition, in Japan, the lower you go down the hierarchy where you do real hands-on jobs at the forefront of production, you would not be treated well either. The pay is generally low especially when I am a new comer who does not belong to any specialist organization; I am compelled to over work to achieve quality that is well above the reward I receive. As a result it can be very difficult to keep motivated. As it happens, I have been submitting, reworking and resubmitting design ideas for robots for a planned robot amine programme for the last 3 months. However, the reword it will bring will amount to less than a month’s rent in total. In this sense, I am working hard doing other jobs so that I may keep myself in this anime project. From an artistic viewpoint what do you try to express when you create these images? It seems that mecha that appear in anime or manga are restricted within these two medium. I would dare to take them out of that framework and pursue mechanical expression in various situations. What do you think of Western graphic design in comparison to Japanese? Do you think Western design lacks originality? I think the western graphic designs are always very advanced. I strongly feel that the Japanese graphic designs lack originality, not the western ones. What advice would you give to aspiring mecha and graphic designers and why? I approach mecha design by assembling what is around me in a symbolic form. Therefore the important thing is to always investigate things around you that can be materials. I think it is important to see and experience things that are in real life, not in the existing amine or manga. In addition, it is vital to establish your own style firmly; your own style that are not an imitation of other people’s style. You also need a strong will as if you were to make a revolution with your own style. Personally I do not believe that there is such profession as a mecha designer in Japan, though it looks as if it does. If there is someone who is making a living solely out of designing mecha, then it only includes a very small number of people that are regarded as real experts in the field. Davvero ho bisogno di una traduzione in Italiano…ma è interesssante.Conosco Barrel – lo conosco veramente – ed era un Gundam diverso,non le solite cose. I really need a translation in Italian … but important . Know Barrel Barrel – really know him – and it was a Gundam different, not the usual. I can’t read Japanese, so I’m not really sure what it’s saying, I’m afraid. Yeah, the site has been archived but I linked to it for posterity. [WORDPRESS HASHCASH] The comment’s server IP (216.240.129.11) doesn’t match the comment’s URL host IP (216.240.129.10) and so is spam. A really intelligent and interesting interview. Thanks for keeping it posted.